In an Isuzu mu-X‘International FIA T2’ production class car sporting race number 407, Western Australian driver Adrian Di Lallo and co-driver Harry Suzuki (NSW) will cover 9,111 kilometres, of which 4,578 kilometres are competitive stages, through Argentina, Bolivia and Chile over 14 days. The ‘International FIA T2’ production class permits only safety and minimum modification to the vehicles, whereas the ‘FIA T1’ full-specification competition Dakar car is heavily modified and often has little similarity to the one on the showroom floor except for the body shape. Di Lallo said he is humbled and excited at the prospect of competing in the new mu-X. “I feel as prepared as I can be for Dakar – it’s one of those events that can throw anything at you at any time,” the 40-year-old said. Di Lallo completed his first Dakar in 2013 in an Isuzu D-MAX ‘FIA T1’ car with an outstanding finish of 38th outright, 101 places from his start place. “With the knowledge and experienced I gained last time, I am confident we can complete the task and cross the finish line. For experienced co-driver Harry Suzuki, this will be his fifth Dakar start. “I’ve finished one Dakar and after this year, I hope I can say I’ve finished two,” Suzuki said. Built from a showroom-spec 4x4 model, the Isuzu mu-X retains its standard three-litre turbo-diesel engine but has been tuned to maximum capacity to produce close to 180kW of power and 600Nm of torque (up from 130kW / 380Nm). The high-torque diesel engine handles desert and tough road conditions with better fuel economy than its petrol counterparts, which means less fuel to travel the same distance reducing the car’s overall weight. Di Lallo explained that having a good team with the right dynamic was critical for success. “Every team member has an import role to fulfil. It’s not just about the driver, it takes a whole team to work together to get results at Dakar and it’s great that we all get along so well – that’s really important when you’re in such close quarters. “We have the right mix of youthful exuberance, experience and wisdom to get a good result - I can’t wait!” Di Lallo said. ISUZU team finished the 2013 Dakar in 38th outright (Di Lallo / Riley) and its best result achieved in 2009 in the ‘FIA T1’ specification D-MAX finishing 11th outright (Garland / Suzuki). Designed to be the ultimate test between man and machine, the Dakar setting and pace will change each day, moving from rocky routes to desert dunes, from endurance stages to extreme sprints. Stage 7 is a marathon stage, split over two days and permits only competitors to work on their cars overnight without the assistance from their service crew. On the marathon stage, competitors will stay overnight in an isolated bivouac at the Uyuni salt plains. A total of 665 competitors from 53 nations will start Dakar in Buenos Aires on January 4, 2015 in 414 vehicles: 164 motorcycles, 138 cars, 48 quad bikes and 64 trucks. The event is a loop course, finishing in Buenos Aires on January 17, 2015. The administrative and technical formalities have now been completed and the thrills of the 2015 Dakar has officially begun for the Australian ISUZU rally team. The day after a spectacular ceremonial start in the heart of Buenos Aires, the Dakar proper commenced. On Stage 1 competitors travelled from the start line in Buenos Aires, deep into the Argentinian countryside to finish in picturesque Villa Carlos Paz. The 170km stage, which will determine the vehicle start order tomorrow, was described by organisers as “having something for everyone”, with both fast flowing tracks and tight technical bends. ISUZU rally driver Adrian Di Lallo anticipated a tough a day, and one was delivered. "What made the day tough was the start order - starting toward the back of the pack made it difficult because the hanging dust was thick which impaired visibility for overtaking," Di Lallo said. "Still, we made up a few places and I'm happy with how we went." Di Lallo with co-driver Harry Suzuki started the day in position 105, and finished the day in 79th position overall. "Harry did an amazing job in the co-driver's seat and we had a lot of fun," Di Lallo said. "The car handled the rough and dusty conditions without fault. "It's only day one and we need to keep the car in good condition - we've got thirteen days ahead of us. "We are keeping calm and staying focused, ready for tomorrow's monster stage." Of the 406 vehicles that made it to the start line, 402 crossed it to complete the first 833 of the 9,111 kilometres they need tackle over the next two weeks - reiterating that this is an event of extreme endurance. Di Lallo and Suzuki are competing in the ‘International T2’ production class, meaning their Isuzu mu-X is tackling the gruelling conditions as a stock, showroom spec vehicle, with only minor and safety modifications. Tomorrow, the longest special stage in the 2015 Dakar route awaits competitors, with organisers warning that constant vigilance will be needed to conquer 518 competitive kilometres of hard, dusty and then sandy terrain. The Stage 2 bivouac will be set up in the lush valley city of San Juan, Argentina. Dakar is known as one of the most challenging endurance rallies in the world. The 2015 event has attracted 665 competitors from 53 different nationalities in 414 vehicles. 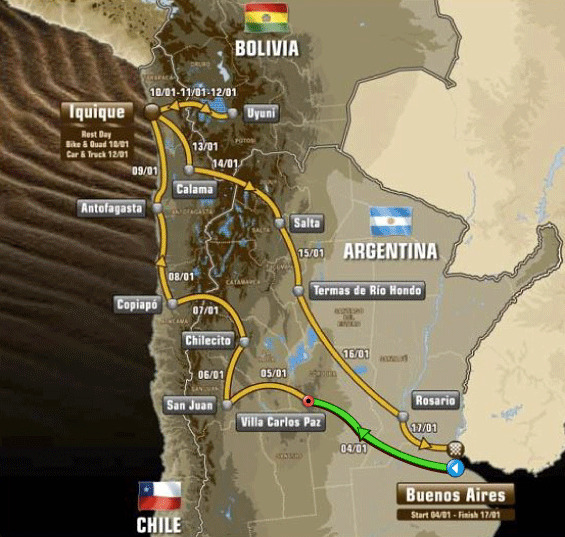 The rally spans over two weeks, following a loop course format, which sees competitors depart from Buenos Aires, Argentina on January 4, passing through Chile and Bolivia, before finishing in Buenos Aires on January 17, 2015. Stage 2 of the 2015 Dakar was designed to unsettle even the most experienced competitors with 518 kilometres of hostile terrain. ISUZU rally driver Adrian Di Lallo and co-driver Harry Suzuki were making great progress moving up places as they passed through the 13 way-points along Dakar's longest stage when they encountered a problem 80 kilometres from the end. At the time of writing exact details are not known. The difficult territory prohibited the service truck from reaching them to assist, leaving Di Lallo and Suzuki to spend the night under the stars in the Pampa de las Salinas, approximately 160 kilometres from the Dakar Bivouac. Further updates will be released as more details become known. Of the 135 vehicles that started the stage, according to the Dakar results website, just 60 have reached the end thus far, some 19 hours after the start of the stage. For Stage 3, the event route continues to take competitors north, where they’ll experience the majestic sight of red earth tracks, overlooking steep peaks and plunging canyons. It’ll be a less busy day for competitors, with a reasonably short 220 kilometre special selection, followed by a 437 kilometre liaison to the small city of Chilecito, which is overlooked by rocky hills with snowcapped peaks. To achieve the level of physical fitness required for the extreme conditions of Dakar, many of this year’s 665 competitors would have spent a couple of years preparing for their entry. Dakar competitors average 701 kilometres per stage, on tough terrain and often in challenging weather conditions. 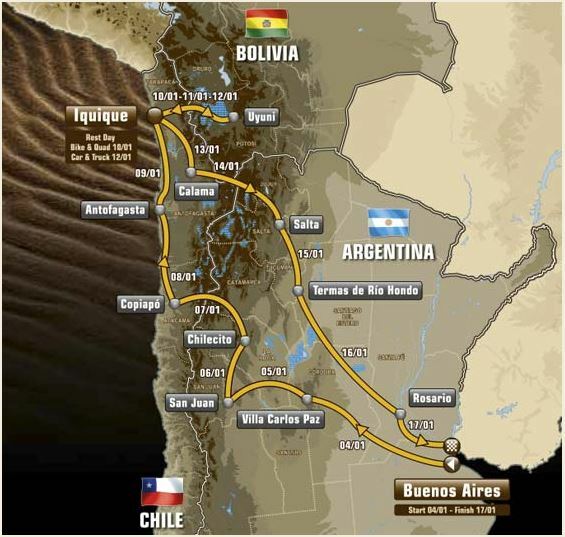 The Dakar Rally is held over 13 days, seeing competitors follow a loop course format, departing from Buenos Aires, Argentina on January 4, passing through Chile and Bolivia, before finishing in Buenos Aires on January 17, 2015. Over two weeks, the gruelling 2015 Dakar Rally tested 414 trucks, cars, quads and motorbikes over 4,578 kilometres of special stages that travelled through Argentina, Chile and Bolivia for a total of 9,111 kilometres on some of the earth’s most hostile terrain. From the scorching heat to freezing conditions, competitors had to conquer giant sand dunes, rough rocky gorges, long dusty tracks, dry and flooded river beds and wet salt plains, reaching altitudes of up to 5,000 metres. The loop course began with a ceremonial start in Buenos Aires on January 3, 2015 and concluded on January 17 with 67 of the 138 cars that started Dakar actually crossing the finish line. Stage 1 took competitors 833 kilometres from the start line in Buenos Aires, deep into the Argentinian countryside, finishing in picturesque Villa Carlos Paz. Competing in an Isuzu mu-X ‘International FIA T2’ production class car, ISUZU rally driver Adrian Di Lallo (WA) and co-driver Harry Suzuki (NSW) finished the first stage 26 places up from their start position, from 105 to 79th overall. Stage 2, the longest special stage in the 2015 Dakar route, had organisers warning that constant vigilance was needed to conquer 518 competitive kilometres of hard, dusty and then sandy terrain. The thick fesh-fesh dust and rough conditions took an insurmountable toll on many vehicles, resulting in less than half the field of cars completing the stage. Of the 135 cars that started Stage 2, just 60 made to the finish. “The car ran beautifully on the first stage, we had great pace and had no issues at all. The hanging dust was like a thick fog and the lack of visibility made overtaking difficult,” driver Di Lallo said. Just 80 kilometres from reaching the end of the stage, the air filter became clogged with fesh-fesh, which then caused an issue with the turbo and forced them to stop. “After fifty or sixty cars had raced before us, the tracks were really chopped up and our car lost power so we couldn’t keep going,” Di Lallo explained. “It was disappointing that we couldn’t continue the race, especially given the problem with the car was so easily fixed,” Di Lallo said. ISUZU team withdrew from Dakar 2015 after suffering a minor mechanical issue toward the end of the second stage. It was a disappointing end for the team, who were confident in the mu-X’s ability to be able to achieve a good result in the T2 production class. The ‘International FIA T2’ production class permits only safety and minimum modification to vehicles, whereas the ‘FIA T1’ full-specification competition Dakar car is heavily modified and often has little similarity to the one on the showroom floor except for the body shape. With retirements each day, just 48 per cent of car competitors completed the full race - a testament to how tough Dakar is and why it lures top rally drivers from all over the world.